Greetland v Ryburn Utd. Jonny Crowther and Owen Wilkinson. Ryburn United produced a stunning turnaround to beat Stump Cross 7-2 in Saturday’s battle of the title contenders in the Haslem Sheppard Halifax AFL. Stump took a 2-0 lead through Adam Barlow and Kai Hadley in the first 15 minutes and boss Craig Walker, playing in goal for champions Ryburn, was fearing the worst. However, the home side switched Owen Wilkinson from centre back to the middle of the park and Ryburn’s 4-5-1 formation worked a treat with their pace too much for Stump. Brad Waddington reduced the deficit from a corner, Reece Uttley made it 2-2 from Joe Swallow’s cross and Christian Silkstone poked Ryburn’s noses in front before half time. Silkstone’s second was followed by Ryburn’s fifth and best goal of the game. A length of the field move started with Walker and Jake Finch, Alex Coburn and Silkstone were all involved before Alex Austin finished from eight yards. Stump had Josh Hiley sent off following an off the ball incident and finished with nine men when his brother Tom was dismissed for dissent late on. By then Ryburn had disappeared into the distance with an own goal and Silkstone’s hat-trick effort. It was a fourth defeat in five games for tottering Stump - one of them came in the Halifax FA Cup semi-final against Brighouse Town - and they now face a major character test over their remaining seven games. Leaders Ryburn have played four games more and have banked 11 extra points as last year’s top two fight it out again. Second-placed Midgley United and fifth-placed Northowram drew 2-2 in appalling conditions at Midgley Rec. A fierce wind and driving rain blowing down the exposed pitch put paid to any thoughts of measured football. The Rams had the elements at their back first but created little as slightly over-hit passes blew briskly downhill for a string of goal kicks. Midgley had a couple of half chances early on. Alex O’Keefe put the visitors ahead after 23 minutes. His free kick bounced back off the wall but his second well-struck attempt took a slight deflection and gave James Brook no chance. The wind and rain abated in the second half, resulting in more goalmouth action. Chris Conroy shot tamely whilst a mistimed header at the other end spoiled the home side’s best chance. Midgley drew level after 57 minutes when slack marking at a throw-in allowed too much time for a cross which James Bunn spilled and Gary Hodgson forced the ball home. Play opened up and the Rams retook the lead 20 minutes from the end when Brook was unable to gather a cross and Chris Conroy side-footed into the empty net. The lead lasted only three minutes, Gary Spink reacting quickest to a loose ball and drilling home the equaliser. O’Keefe fired narrowly over and forced a good save from Brook whilst Ian Hudson and Spink were off target from good positions for Midgley, who finished on the front foot. Honours were also even at Ryburn School where Sowerby United and Calder ‘76 drew 1-1 in a game which was a fine advertisement for local football. In difficult conditions, there was little between the sides with defences on top but Sowerby made the breakthrough on the stroke of half time when Luke Bridges surged into the box and fired home. Calder came out strongly in the second half but were kept at bay by defence from home player-manager Garry Boyd and Jake Allott. Karl Wooliscroft was working hard for Calder in midfield but it was substitute Paul Ashman who engineered the equaliser with his first touch. He swung over a deep cross and Jonny Gibson rose above everyone to head home. Sowerby went in search of a winner but found Sam Taylor on top of his game for Calder. Copley United stayed four points ahead of Sowerby after a 2-2 draw with bottom side Elland United. Dan Willars and Jason Taylor scored for Copley with Kerry Muncaster and Adam Goldthorpe replying. Carl Ainley’s goal for Greetland was in vain as they lost 2-1 at home Warley Rangers while Hebden Royd Red Star’s home game with Shelf United was postponed. Division One leaders Holmfield made light of a tricky-looking trip away to Calder ‘76 Reserves, winning 5-0. Jordan Pettifor, Dan Kirman, Chris Woodhouse, Martin Woodhouse and Mick Palethorpe helped them retain their 11 point advantage over Mixenden, who have played three games fewer. Mixenden scrambled through 4-3 against a lowly Stainland side who have been battling hard in the last month in an effort to stay up. Damien Randall gave them the lead at rain-lashed Natty Lane. Stainland struck twice and Mixenden’s problems mounted when ‘keeper Ian Fenwick was injured, fullback Brad Smith going in goal, and then the visitors got a third after the break. However, a Randall penalty launched a Mixenden fightback. Adam Gaze made it 3-3 and Randall completed his hat-trick with the winner 10 minutes from time. Stainland will have been dismayed to see that next-to-bottom Halifax Irish Centre were surprise 4-2 winners at home to Ryburn United Reserves. Craig Eastwood (three) and Wahid Mahmood netted for the hosts while Richard Redhead struck twice for Ryburn. Denholme United made it three wins on the bounce with an 8-0 home success over Elland Allstars. Michael Midgley is in tremendous form and scored both first half goals. When he added a third and Luke Dickenson a fourth soon after the break, Allstars’ confidence drained away and Neil Roberts, Matty Waring, Midgley and John Judson put more daylight between the teams with Waring’s goal an excellent individual effort. The goals also flowed in the section’s other two games, taking the six-match total to 49. Volunteer Arms got the better of Salem 6-5 with doubles from Mark Kelsey and Luke Oldridge. Sowerby Bridge are up to third after a 7-3 win away to Crossleys, Luke Wood, Chris Doyle and Jordan Bedford scoring twice each for the winners. Only three games were completed in Division Two with Shelf FC’s game against Salem Reserves abandoned after 33 minutes due to waterlogging with the hosts 1-0 up and Denholme Reserves unable to raise a team to travel to St Columbas. 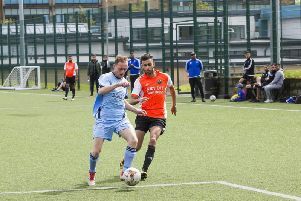 Brighouse Sports stretched their lead over inactive Illingworth St Mary’s to 10 points, from four games more, with a 6-0 win away to Shelf Reserves. Strike duo Chris Allan and Borhan Doski scored five goals between them. Hebden Royd Red Star Reserves went goal mad away to Sowerby Bridge Reserves, Lamin Touray showing the way with a hat-trick. Alex Abson netted twice in Northowram Reserves’ 3-1 home win over Sowerby United Reserves.